Frankfurt - the most important city of money in Germany and one of the biggest in the world. 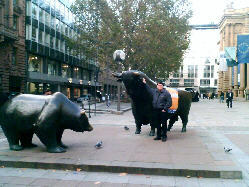 Home of the European Central Bank and place of all Major Banks of the world. Doing surveys in Frankfurt am Main and the surrounding area very often. Very good knowledge of this location. Very good contacts to local craftsmen services.